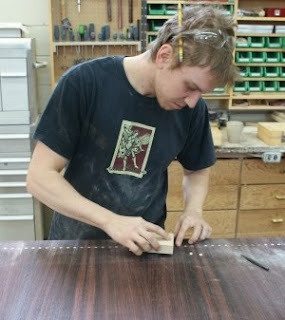 Musings of a Furniture Maker: The Executive Office - (Part 5) - Let the Furniture Making Begin! 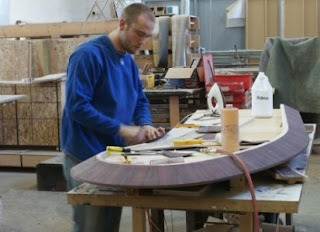 The Executive Office - (Part 5) - Let the Furniture Making Begin! Yesterday's post assessed the furniture designs for JLT's office from a Feng shui perspective. Today's post will focus on some of the actual furniture pieces being made. 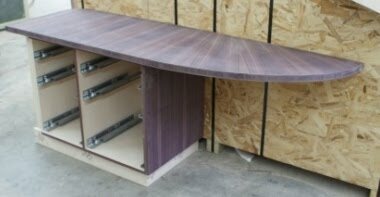 These photos show the credenza that will be built into the corner behind the desk. The pedestal base will hold 2 banks of drawers, with each bank being 2 box over file. The file size on the left will be standard, with the files on the right being legal. All drawers will run on self closing Blumotion slides. The credenza top is shaped to the actual contour of the wall, thanks to a template that was made during site measurements. Note the clipped corner that will accomodate the existing bridge piece in the wall corner on site. 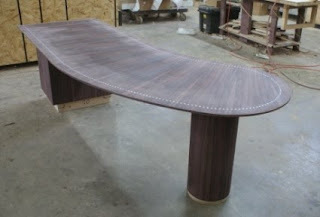 The grain pattern of the top has a radiating pattern that runs perpendicular to the contour of the edge. 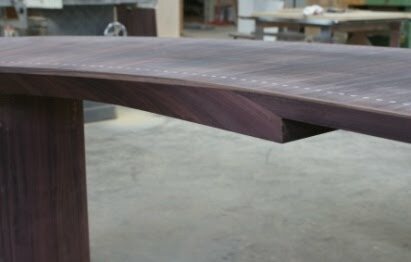 The focal point of JLT's office will be the desk top, which is a modified kidney shape that will be cantilevered off the wall on the right side. 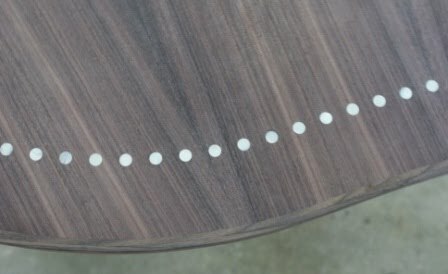 In these images Heath and Kevin carefully sand and fit over 250 pieces of mother-of-pearl inlay into the face of the East Indian Rosewood top. This is nerve wracking and labour intensive work, with zero margin for error. After completing the mother-of-pearl inlay the top was flipped over to add an apron with an undercut bevel edge to the underside. In the image below Kevin is putting the finishing touches on the transition piece where the undercut bevel twists back to a vertical plane. 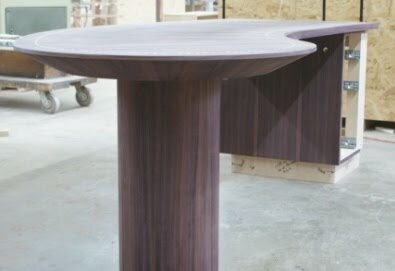 Since the desk top is going to be cantilevered off the end pedestal it is necessary to ensure that the support colum at the other end is strong enough to hold the top securely in place. 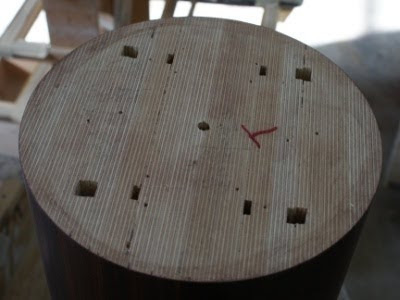 To achieve this we over-engineered the support column by making it out of stack laminated Russian birch ply, with four embedded channels to receive steel rods than can be bolted into the concrete floor as required. 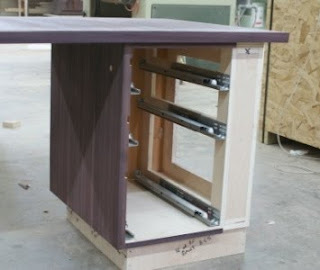 When the desk is fully assembled these support mechanisms will be completely hidden. 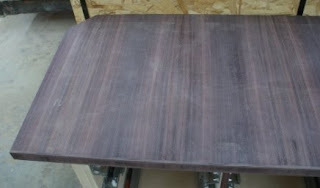 Now the desk nears completion - at least from a woodworking standpoint. Soon the sanding and finishing work will begin. 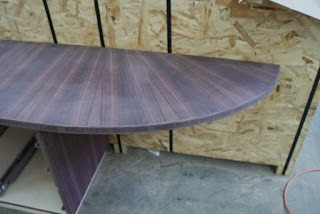 An end view of the desk, showing the cylindrical support column and the sweeping bevel edge. 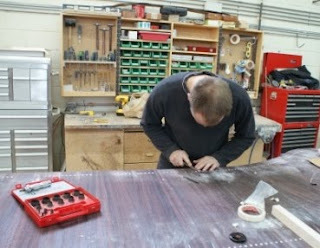 The drawer pedestal on the desk is reinforced for bolting to the wall on site. Interior raceways have been provided to access electrical, telephone and data cable boxes, with all wiring to be completely hidden after the desk is fully assembled. The recessed plinth base will be clad in satin stainless steel. A detail view of the top showing the mother-of-pearl inlay. A close-up view of the bevel transition. The video below gives a better perspective of the undercut bevel edge, as viewed from the underside. Wood Finish Samples as "Business Cards"
We're Now Published in Switzerland !